Well Hello Gorgeous at Scrapbook Boutique (video)! Back with another video for Scrapbook Boutique and today I’m die cutting again. I just adore these flowers from Memory Box, they really have the sweetest dies! Other Supplies: Cardstock – Grapefruit, Shrimp. Copics – Y11,21,38. < Previous Time to challenge… Marion! Next > Time for a new Challenge at Scrapbook Boutique Bloghop & Giveaway! Oh, this is the sweetest card Therese! Love the layered tulips! Another really pretty card, Therese! 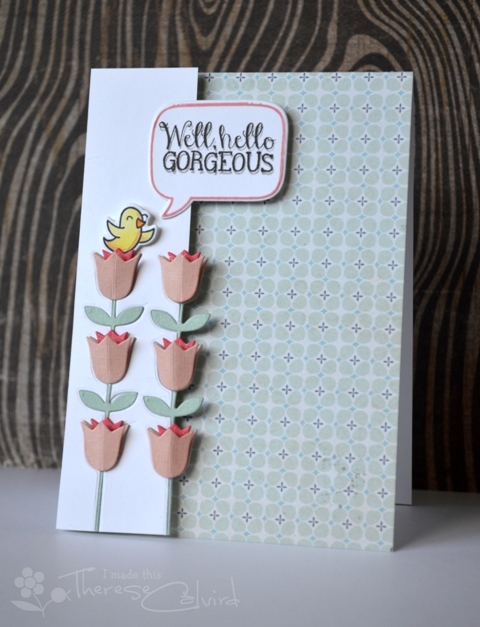 I love your partial die cut flowers and the little birdie is too cute! Thanks so much for the video! Gorgeous 🙂 Another fab card. I like the side panels/inlaid die cut. Very cute bird too. Thanks for sharing and inspiring. This is so sweet Therese. Simply gorgeous, and I learned so much from your video! Thank you! eeeeeeeeeek! I’m gonna die of cute!! I LOVE how you tucked that widdle bird into the flower! such a great card…love how you did the die cuts and used the cute bird from LF. That line up of flowers is so sweet. Topped off by that cute birdie! Great card.